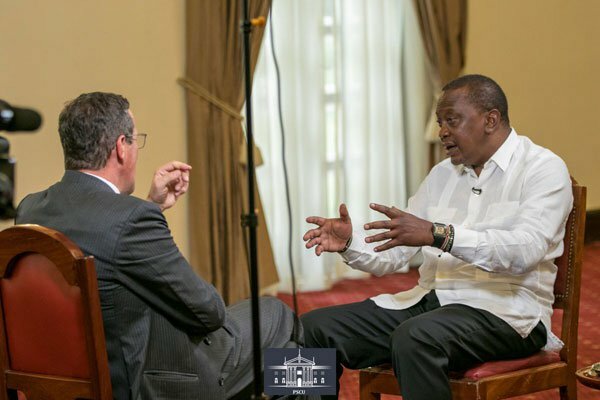 President Uhuru Kenyatta reveals his intentions of not running for a third term according to his interview with CNN's reporter Richard Quest. President Uhuru Kenyatta revealed his intentions of not willing to change the constitution in order to run for another term in office. This was said in an interview with Richard Quest of CNN on Friday last week, a video that was later released on Monday. “I’m not interested in a third term,” Mr Kenyatta replied while asked if he has a plan of changing the constitution. Kenyatta also revealed that his handshake with the now African Union Representative for Infrastructure Development in Africa Raila Odinga was meant to bring about development to Kenya. Among other questions, Kenyatta was also questioned of whether he is bothered by the country’s debt to the Chinese. Kenyatta revealed why people are only focusing on China as the only lender to Kenya and not other multilateral lenders like World Bank and African Development Bank. “As far as I am concerned, we have a very healthy mix of debt from the multilateral lenders — who are basically the World Bank and the African Development Bank — to bilateral lenders like Japan, China, France, all who are participating and working with us to help us achieve our objectives,” Kenyatta added. Kenyatta was also quizzed on China’s intentions of giving loans to African Countries.